Open Arms Ministry (OAM) is a not-for-profit 501c3 organization that supports and partners with those struggling with homelessness, poverty, and food insecurity to enhance human dignity, community, and opportunity. 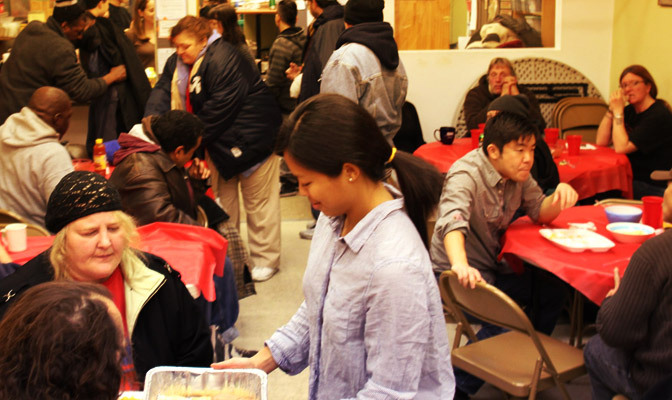 Open Arms is deeply connected to New Community and uses the fellowship hall and kitchen area to serve the community of Logan Square. What does Open Arms Do? Open Arms Ministry has two programs addressing homelessness, poverty, and food insecurity on the northwest side of Chicago. The Open Arms Drop-In provides basic relief services to individuals struggling with homelessness or at risk of becoming homeless. More than relief from the weather outside, the drop-in ministry enables those who come to share a meal with friends and get connected to resources. Brothers and sisters at the drop-in also receive help meeting physical needs like clothing, toiletries, and basic healthcare. Referrals are available for services such as overnight shelter, recovery, and education. Working in conjunction with the Greater Chicago Food Depository, the Open Arms Food Pantry serves families and individuals who live in the immediate Logan Square area bounded by Irving Park, Fullerton, Pulaski, and Western. All are welcome (proof of address required), including those who have experienced job loss, illness in the family, unexpected expenses, and more. The work of Open Arms is only possible through volunteer support. A variety of serving times/dates are available and partial shifts are accepted. To lend your hands and feet, contact Kimmy Noonen.